Wondering how much your old Dumbo, Bambi or Cinderella or other Disney VHS tape is worth these days??? Well, according to this recent article from Snopes.com, your Disney tapes are probably worth something, but old Disney VHS values are not remotely close to as much as has been widely reported. Over the past few months, I have seen a number of posts on blogs and news sites reporting that rare “Black Diamond” editions of the Disney classics on VHS were going for thousands of dollars on eBay. This was due to the rarity of the series of tapes. Snopes points out in their investigative piece that, while there are a number of Black Diamond listings for thousands of dollars on eBay, there are only few that have fetched over $20. Thus indicating that it is a case of hopeful suppliers and uninterested buyers. They further explain that the Disney Black Diamond VHS tapes are not exactly rare, but are becoming collectible. What are Disney Black Diamond VHS Tapes? The Disney ‘Black Diamond’ collection refers to the original Walt Disney Classics series of Disney VHS tapes that were released between 1984-1994. They were noted for their Walt Disney Classics logo, which was shaped as a black diamond and could be found on the spine of the tape case. In all, 20 different animated Disney movies were included in the collection with the first five being released twice during the ten year span. Here is an idea of what some of these Disney Black Diamond Edition VHS tapes are selling for currently. All hope is not lost. As we all know, just about everything goes up in value over time, so these Disney VHS tapes may not be worth that much now, but keep them and eventually they will. Additionally, many of these movies are getting remade by Disney. We’ve already seen remakes of Beauty and the Beast and The Jungle Book and in the near future, we will have modernized versions of Dumbo and Aladdin. One can imagine, this remake trend will rekindle interest in the classics, pushing the value of these tapes higher. 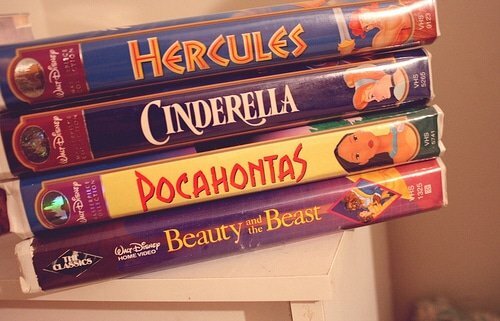 DisneyNews » Movies » Disney Pixar Movie News » How Much are Your Disney VHS Tapes Worth?